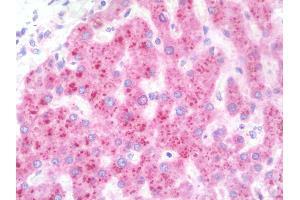 Anti-TMX3 antibody IHC staining of human liver. Immunohistochemistry of formalin-fixed, paraffin-embedded tissue after heat-induced antigen retrieval. Antibody dilution 1:100. Specificity This TMX3 antibody is generated from rabbits immunized with a KLH conjugated synthetic peptide between 402-431 amino acids from the C-terminal region of human TMX3.